Now into our third generation, we are an award winning family run bakery with over three decades of experience. We are committed and passionate about what we do, which shows not only in our products but in the service we deliver to all of our customers. Our recent move to our new bakery in Laurencekirk, means we are able to reach a much wider market not only in the UK but overseas as well. Yet, we have still retained that personal touch that we’ve had from day one. 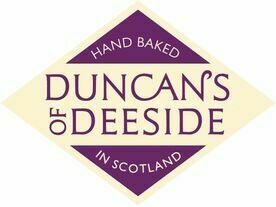 Here at Duncan’s of Deeside, compromise is never an option. We only select the finest ingredients and strive to create an incomparable quality in all of our products. They say the proof is in the pudding. Well Duncan's say the proof is in the biscuit! "